Pigeon Forge Attractions: Flyaway Indoor Skydiving - Bear Camp Cabin Rentals. Flyaway Indoor Skydiving gives you the chance to test your skills of human flight during a single flight session or as a participant in a personalized coaching program. 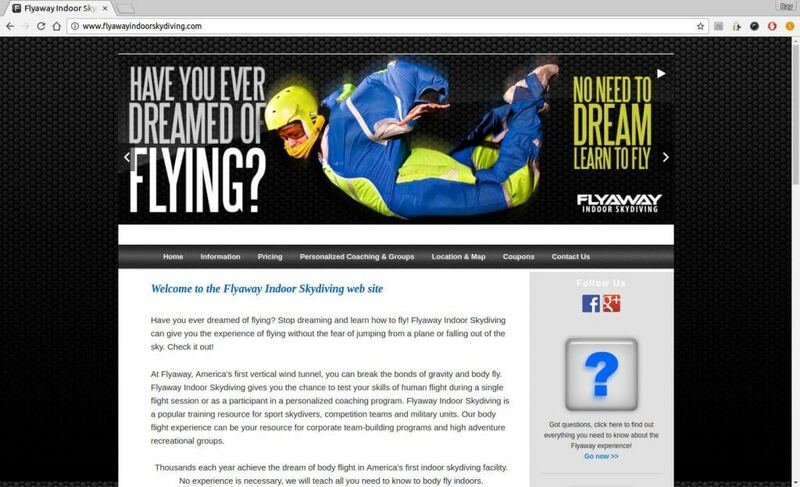 Flyaway Indoor Skydiving is a popular training resource for sport skydivers, competition teams and military units. Our body flight experience can be your resource for corporate team-building programs and high adventure recreational groups. Thousands each year achieve the dream of body flight in America’s first indoor skydiving facility. No experience is necessary, we will teach all you need to know to body fly indoors. Choose the location you wish to visit above and receive all the information you may need to make your trip enjoyable and one you will never forget. As a flyer, participants attend a 20-minute training class where body control techniques and safety procedures are discussed. The next step is equipment preparation. Flyers receive a suit, helmet and other safety equipment. Following a short review of the basics, a group of five flyers then enters the wind tunnel with their instructor. Participants take turns flying during a 15-minute session. Each individual will receive approximately 3 minutes of airtime. During business hours, classes are conducted every hour and half-hour. Registration for class is on a first come, first serve basis. The best time to fly is early in the day. Please budget up to an hour and 15 minutes for your visit.